This used Yamaha YSL-548GOAL Trombone is in good cosmetic and playing condition. It includes a case and mouthpiece. This trombone has been ultrasonically cleaned and had some minor dent work by our instrument repair department. 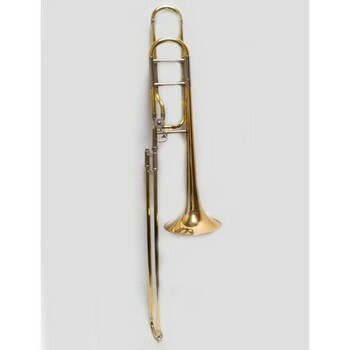 The Allegro trombone features an 8½"gold brass bell. Gold brass produces a warm, rich tone. Using a mechanical linkage on a rotor valve gives it strong smooth operation. Made of sheet brass and hand formed, the Allegro trombone's bell produces a markedly improved resonance. The open wrap has a more open feel and quicker response while using the F-attachment. For complete information about the Yamaha Allegro line of instruments including a brochure you can download, 7-year warranty information and the authorized Allegro dealer in your area, click on the appropriate menu links on this page. Inner Slide Material: The inner slide material of the Allegro trombone is chrome-plated nickel silver. Outer Slide Material: The outer slide material of the Allegro trombone is yellow brass. Clear Epoxy Lacquer: Microscopic, electronically-charged particles of lacquer are attracted to and deposited evenly on the surface of the instrument carrying the opposite charge. The sound produced is a solid, somewhat harder sound than silver-plate finishes.